These are show notes taken from an audio interview. To listen to the actual interview, please use the player above. 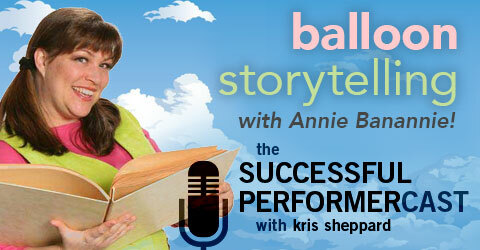 In this interview, Annie Banannie takes us into her career as a balloon storyteller. She talks about working with children, satisfying clients, and ultimately making a difference in the kids lives. Annie is a children’s book author who doesn’t just write and sell her books, but also creates “balloon theater” where she uses balloons to tell stories. Her shows are tailored for elementary schools, public libraries, preschools, and family events, and her mission is to help children realize that they have amazing creative ability hidden within themselves. With her, every balloon has a story. 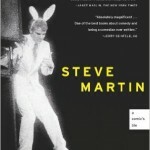 I just finished listening to the audio version of Steve Martin’s book Born Standing Up and I get something new out of it every time! If you haven’t read it, you should definitely check it out. If you wait until everything is perfect, you’ll never do it. • What is balloon theater? • With kids, laughs per minute isn’t as important as interaction with the humor. • Never be afraid of straying from your plan. • Making you volunteer have more fun on stage than anyone else in the audience. • Working with special needs kids on stage. • Making a difference on kids lives. • Having a special needs kid up on stage being successful isn’t only for that kid, but all the other kids in the audience as well, breaking down the barrier between the common kids and the special needs kids. • Working with the client (teacher, parent, principal, etc.) to achieve their goals. • Working within the school’s schedule. • Librarians talk about who they hire for entertainment and are brutally honest on how they liked or didn’t like them. • Not waiting until things are perfect. • Selling your product before you make it. • The importance having a coach and always learning. Tells how she botched a silent act in Japan where she wasn’t prepared enough in front of 2,000 people. Talks about how out of necessity of not having her props. she blew up a bunch of balloons and did a “create your own story” for the audience which turned out being a huge success! Where can we find Annie Banannie?